The organised spreading of chaos, anarchy, anti-Dalit sentiments all have a pattern. Now, in addition to this they have the Kashmir strife to scream about. Many believe the noise over Ramya was created to distract from the crimes of Amnesty India (AI). AI recently held a conference in Bangalore to discuss some “Constitution values” supposedly. But incidents at the event where Kashmiri Muslims shouted anti-India slogans and demands for “Azaadi” made it amply clear what AI’s real agenda was. 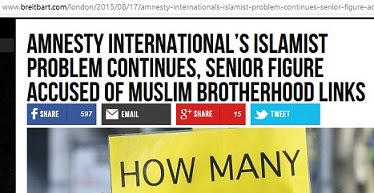 I don’t care about the sedition charge but Amnesty has an international reputation for fraudulent reporting, bias and even financial skulduggery. And the fact that an anti-Hindu writer like Aakar Patel who claims “Hindus killed Sikhs” in 1984 and not the Congis (which may include Muslims and Christians as we know) shows how this biased, hate-filled man and his organisation are spreading poison. That the Bangalore event was intended to provoke anti-India poison is not a secret at all. And shameless Congis and Aakars of this world defend this as FoE. The same Aakar Patel had claimed “The critical learning was that freedom of speech in India must be regulated”. This was over the Gujarat 2002 riots. For Congis and Sickulars FoE is a convenience toilet. Try this – It was Nehru who amended the Constitution and crushed free speech. It was IndiraG who imposed Emergency and gagged media. It was the Sonia regime that passed the stupid 66A law. It was Sonia regime that filed 7000 sedition cases against the Kudankulam protesters. You know what hypocritical scumbags we are dealing with because they are out of power. Now, the Kudankulam protesters were not demanding Azaadi or shouting anti-India slogans. They were protesting a nuclear plant. But that constitutes sedition for these Sickulars but anti-India slogans do not. Many countries now demand that visitors, immigrants and entities sign a declaration that they will not indulge in any anti-national activities against that country. India should make a law that makes anti-India actions punishable and no foreign visitor or entity should be in India without signing a similar declaration. Besides that, GOI has already refused permission to AI for a South Asian Hub in India. AI is another of those violating FCRA laws and should be shown its place. Founder of modern-day terrorism and hero of jihadis, Yasser Arafat, in his first speech in the UN stated: “Today I come bearing an olive branch in one hand, and the freedom fighter's gun in the other. Do not let the olive branch fall from my hand. I repeat, do not let the olive branch fall from my hand”. Terrorists take pride in calling themselves “freedom fighters” but care two hoots about killing innocent civilians anywhere. Regardless of what GOI says in public, I am certain ModiSarkar is doing the same with the militant and stone-pelting Kashmiris – An olive branch and the gun. The Kashmiris will deal with either of the two; it’s the choice they make. 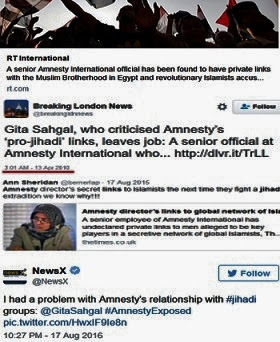 As for Jihadi Amnesty, they should learn to respect India, her maps, her borders and her integrity else they can get out or should be thrown out. GOI should b tough on these external n internal break Ind agents n most important to counter n expose Congi evil designs. The thing to be done with utmost importance is to expose these anti-national forces in MSM, Politics, pseudo-intellectuals, NGO's and take the message to as many people as possible apart from SM. Then only we can show these people their place. 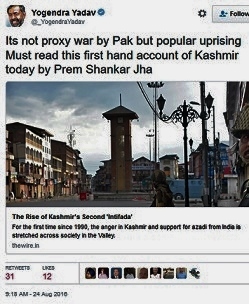 @srinivas s, mediacrooks might be bjp chamcha, but you should tell what he wrote wrong? do you believe AI is purely doing the right things? or do you want anti-india slogans to continue being in India? why don't you write some thing on bjp and its evil designs where the neutral people can read and support your's as well? I think Hindus should think this seriously. For too long we had been ignoring these options. Let us fulfill their wishes of “Hindu Supremacy". It is well known that all cinema actors & actresses are dumpest characters in real life. 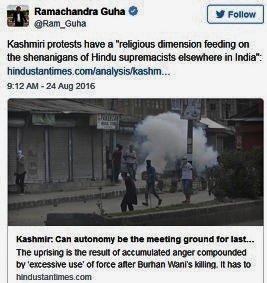 This lady Ramya rumblings on Pakistan is a heaven on earth, reflects how much they know about India or Pakistan. India should plead with Pakistan to giver her Pakistan passport & citizen and get ride of all such anti-India characters. Being good looking she can serve many others in Pakistan or its nefarious designs by giving birth to another dozen children to get killed by Indian forces for India is karma bhoomi and it is good for them to be buried in Indian soil. I am amazed at that Khangress has so many sleeper supports in all spectrums / places / locations in India, surfacing each day one by one as if they are in que !! Recall some old predictive manuscripts in Rayalaseema area of Andhra Pradesh, read to me in early 70's, that India will have problems in every state & location and slowly each will be resolved.... now after 45 years, I am seeing everything happening as foretold by the great seer Sri Veerabrahman. Time is set for new laws that those asking or carrying false definition of freedom of speech and freedom of expression. On this holy day of Krishnasthami do not want to write anything bad, but reserve it for later date. It is time to hold sessions in each village or town on what is acceptable and to be rejected and these public meetings to target or challenge the sickular intellectual & cabaret dancers of Khangress on ideological platform, irrespective of public debate outcome, the public will be aware of certain logics and this increased awareness will defeat khangress nefarious designs. It is an open secret that a good amount of the film industry is bankrolled by the mafia. Where actresses are concerned, I have a low opinion of most of them. Very good comment. We all must understand and put our collective might so that Amnesty type of fraud organisations are denuded of all high moral ground and persons like Ram Guha, Ramya, Sardesai, Barkha, Prannoy Roy, Brinda Karat, etc. are booed out of public scene at least. Newspaper like HT should as well be brought to so low publication level that they do not have any effect of manipulative agenda they carry. We are doing it as a swayamSevak but many more are always welcome. We are telling the masses what is Fare and what is foul as per Dharma. The "Jan Jagran" , The "Dharm Jagran" and all other activities are going on . we require whole hearty support of one and all nationalists to help in this never ending mission and make the Bharata a Vishwaguru. The sickulars, TSS and presstitutes will use all and any means to target Modi. Modi is proving a much bigger headache for them than the likes of Vajpayee and Advani. The BJP Trojan horses are trying to sabotage him and they have been able to achieve some success. Right on mark Ravinar!! India shd really upgrade its visa forms like USA...Self declarations which create a self noose.it shd stop nonsense like Rajnathsingh doling out rhetorics...he says we r reconsidering pellet guns!!??? What is his idea of a substitute?? Is he searching for guns that shho flowers on protestors?? Why dont we realise that timely action stops keedas from growing into monsters!! So called gtown up ppl, so called good politicians but simply hv no foresight beyong 5 yrs. Their latency harms us n our future generations..they r just leaving a mess,unsafe atmosphere for future indians. Instead of pellets,use REAL bullets n see how they run back to their motherland pak...at times peace can b brought only with guns..particulary if opponent knows only that language. 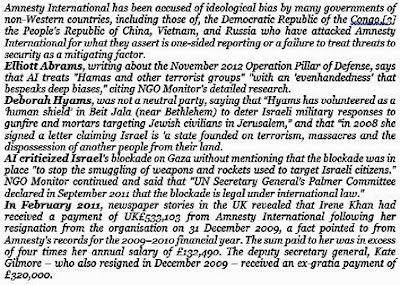 This nasty organisation is apt to be called Atrocity international supported by audacious arrogant self servers . Luckily any thing Narendra Modi says or does, it is totally opposed by Congress and Pseudo Seculars. That puts them staunchly against the national interest. 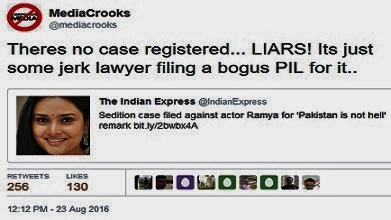 Just take the example of this actor Congress lady. She just cannot help but say opposite and even if that means admiring Pakistan and what is going on there. Take it from me that anti-Hindus are germinated only from Catholic schools.Scratch any secularist he would have education in Catholic schools.Still more serious is giving leadership to a rabid Catholic like Rahul Gandhi who now openly joins hands with a fellow like Kancha Illaiah who vows to finish Hinus and Hinduism.Hindus should look to Rahul Gandhi as a religious leader and not a political leader. Netanyahu did not even care for a UN resolution asking Israel to stop bombing of Gaza strip.Here all secularists crying against use of pellet guns against rioters who are throwing bombs and acid bulbs against our security forces.Beg of Narendra Modi not to become another Vajpayee. These Media quislings will not be able to succeed to silent on what Modi tells and acts. Because Modi understood them and he has visited most of the countries to establish his credentials, which include the Muslim Countries including Saudi Arabi. Who cares for these morons like Burkha Dutt or Aakar Patel. No one takes these people seriously. The International community is convinced that Modi is doing the right thing. One has to see the Pak Channels how they cry each day on Modi. They cry the world is silent etc. Modi is a few steps ahead of the Pak game. See how he extended a carrot which the Pakis thought was an act of a weak P.M.. This was only to show the world that India was for peace. With the Pathankot attack and the Kashmir terrorists infiltration, the world has understood the the Pak game. So, when Modi raised Balochistan and POK, it was thumbs up for Modi. Now Modi is wielding the stick and the world is silent while the Indian Congi Agents shout. Who cares for these Presstitutes. Agreed one hundred percent. Compared to say twenty years ago, Kashmiris have lost sympathy of the world completely. Last thing the world wants is one more radical Muslim country. So all demands of freedom from Kashmiris fall on the deaf ears of the world. Excellent detailing of the Modi policies on go. Here I just wanted to add a SwayamSevak is always for Mann Bharati and come whatever in way The Bhagwa is our Supreme Guru and it shows us the way in time of difficulties. A Hindu is always secular, there is nothing to add. Its feeling of the non seculars which help them to see the world with their lens. They have to come out from their Den to see the New BharatVarsha and we are here to realise dream of the AkhandBharat in days to come. Mr Modi has already initiated a few steps towards this mission. Congi Shahi Tharoor has a teared Pant since He realised that BaharatVarsha Is leading towards being Hindu Rastra. We do not care for Commis,Congis and Maya,Mamta or Mulayam and any other politician like Pawar. We are at our tender hooks to complete the job as illustrates above . Mann Bharati Sab ko Sadbuddhi de!!! Let The conscience prevails on one and all! !